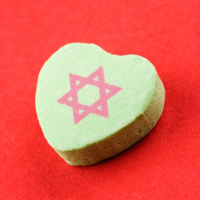 Oy!Chicago - Should the Rebbetzin Get Candy on Valentine’s Day? Should the Rebbetzin Get Candy on Valentine’s Day? My grandmother, Row Row, called me the other day and began our conversation with, "I am mad at you." Now there are few things in this world that I am sure about and one of those is that my Row Row could never be mad at me. I responded, "Row Row what did I do?" She said, "I asked Papa if it was alright if I sent Annie (my 6 ½ month old daughter) a Valentine's Day card and he said you would not want it because you are a rabbi. And then I ended up getting a Valentine's Day card from Annie." I said, "Row Row you can always do as you want, Annie is happy to get love from her Row Row any day of the year." This year I have begun a great deal of research on the topic of Halloween. I have mainly centered my research around Leviticus 18:3, "You must not do as they do in Egypt, where you used to live, and you must not do as they do in the land of Canaan, where I am bringing you. Do not follow their practices." This verse has produced commentary from rabbis for hundreds of years in relation to celebrating secular and non-Jewish holidays because of the words "their practices." I hope to present my research to the kahal, community, sometime next year. But while I look for answers regarding Halloween and a Jewish perspective on the topic, I ran into many writings about Valentine's Day celebrations and its permissibility for the Jewish people. Now please note that I am aware Jews celebrate Valentine's Day, the question is whether or not halahkically, according to Jewish law, that celebration is permissible. In a paper written by Rabbi Michael Broyde, an Orthodox rabbi and professor at Emory, he concludes; "I think it is the conduct of the pious to avoid explicitly celebrating Valentine's with a Valentine's day card, although bringing home chocolate, flowers or even jewelry to one's beloved is always a nice idea all year round, including February 14th." Broyde has permitted Jews to celebrate Valentine's Day with presents and other romantic gestures, although note he differs in the observance of Halloween. Broyde comes to his conclusion believing that Valentine's Day has completely lost its status as a gentile holiday; just as New Years has in modern times. He quotes Rabbi Moshe Feinstein, one of the greatest deciphers of law over that last 100 years, who wrote; "On the question of celebrating any event on a holiday of Gentiles, if the holiday is based on religious beliefs [by the Gentiles], such celebrations are prohibited if deliberately scheduled on that day; even without intent, it is prohibited because of marit ayin (for the sake of appearance)…The first day of the year for them [January 1] and Thanksgiving is not prohibited according to law, but pious people [balai nephesh] should be strict." Broyde suggests that Valentine's Day's (the celebration of love) is something Jews can buy into. This is different than Halloween's rituals, which Broyde feels are traced back to Gentile origins. He finalizes his opinion by once again using Rabbi Feinstein as his source, "Thus, it is obvious in my opinion, that even in a case where something would be considered a prohibited Gentile custom, if many people do it for reasons unrelated to their religion or law, but rather because it is pleasurable to them, there is no prohibition of imitating Gentile custom. So too, it is obvious that if Gentiles were to make a religious law to eat a particular item that is good to eat, halacha would not permit eating that item. So too, any item of pleasure in the world cannot be prohibited merely because Gentiles do so out of religious observance." Thus Broyde is able to approve the chocolate obsession that surrounds Valentine's Day and permits it for Jews. The question now becomes just because we can celebrate Valentine's Day, does that mean we should? Plenty of things in this world are permissible but that does not mean we should observe them. For example, rooting for the Cubs is permissible, but I would never recommend anyone actually be a Cubs fan. In Rabbi Feinstein's first statement he wrote, "But pious people should be strict." Certainly I agree with that, but it's not necessarily only pious Jews (I believe Rabbi Feinstein really means observant), couldn't all Jews be strict? The fact is that Valentine's Day, New Years, and even Halloween are so regularly celebrated by American Jews. I attended Jewish day school K-12th and I think I celebrated all of these holidays in some fashion every year. However, it would seem that there is a Jewish problem when Halloween is more readily observed than Purim or New Year's more than Rosh Hashanah (or at least day two). The Jewish people have a day dedicated for love called Tu B'Av (15th day of the Hebrew month of Av). This day usually goes unnoticed since it is during the summer months when Jews are at summer camps or not in Hebrew school. This holiday was originally associated with the grape harvest and took on symbols of love and fertility. And yet, I imagine more Jews celebrate Valentine's Day than we do Tu B'Av. Since every store and television show obsesses over chocolates and teddy bears and it seems like a no brainer that American Jews are more familiar with Valentine's Day. This is probably why today's American Jews care just as much, if not more, about their American identity as they do their Judaism. Americanization is intrinsic and Judaism is often attained, regardless if someone is born Jewish. However our debate really comes down to defining our Judaism. That is why rabbis have written about Leviticus 18:3 and not celebrating "their practices." Even if Jews can celebrate the holiday, is it "theirs" and can "theirs" also be ours? So to Row Row I say thank you for the gifts. It is a wonderful gesture and I love you even more for being sensitive about it. And to my daughter and wife I certainly smile a little more on Valentine's Day, even if it is just a reminder of how wonderful the women in my life are. To Rabbi Broyde I say, did Rabbi Feinstein celebrate Valentine's Day and if not (which I am assuming he didn't), how do we reconcile standing on his words? And to the Jewish world I say it's up to you and your communities to decide how to celebrate all of these holidays. I just hope and ask that we treat our Jewish holidays with as much love as we do our secular holidays.